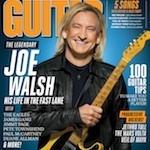 For the May 2012 edition of Guitar World magazine which features the legendary Joe Walsh on the front cover, I put together my back cover column “Last Licks” based around some old school bending and repetition licks. 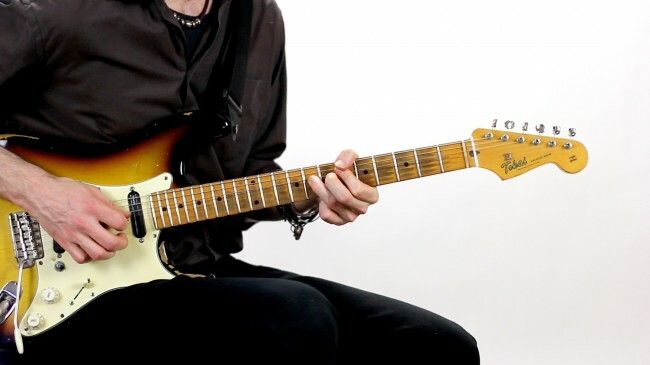 These are the well-known generic cliches of the authentic classic 1970′s rock guitar era, well used by players like Jimmy Page, Alvin Lee, Ted Nugent and Ace Frehley. With the evolution in amplifier technology and the increase in gain towards the late 1970′s, along with the invention of the Floyd Rose, high output pick-up’s and low actions, players like Eddie Van Halen, Randy Rhoads and George Lynch would reinvented these licks in the new 1980′s hard rock era with a more aggressive nuance, a harmonically rich attack and tone-wide, slow vibrato styles, which would help cut through a hard rock/metal mix. For the video, i thought it would be a great opportunity to hear and compare both vintage and modern approaches for each example, with a medium gain and vintage type fast/shallow vibrato followed by a more hot-rodded 80′s approach with full saturation and a wide/slow vibrato style, hit hard with a sliced semi harmonic pick stroke! For the audio I used an Axe FX II set up with Marshall Plexi Treble type sound with the drive set to full and the boost engaged, and a TS808 type tubescreamer with the drive set to zero. For the modern rock/metal versions i used a modded JCM800 sound with the gain on 3 o’clock, and the TS808 with the gain again set to zero, all played through the deadly Tokai Goldstar loaded with DiMarzio choppers! (see gear page) Then straight to an Apogee ensemble card into a Mac Pro running Logic. For Video, a Canon 60D and FCP X for editing. The supporting video goes into some detail breaking down the examples in a way that will be accessible for intermediate level players and has some behind the neck angles to see the arm/wrist rotation for the bending and vibrato. This entry was posted on Saturday, May 12th, 2012 at 1:11 am	and is filed under News. You can leave a response, or trackback from your own site.